Perhaps it's because I'm so clumsy. Well, maybe not clumsy. I'm a strange mix between being a perfectionist, but one who isn't terribly careful. This can make life pretty frustrating. I like to dress smartly but spend most of my time with coffee stains down my shirt, mud up my trouser legs and rips in my jackets. I'm a pedant, but I'm well aware that I make the same mistakes, and more, that I chastise other people for making. I've got some toggle in the mind-body connection which means that if I'm really careful, I can be relatively coordinated. With many thousands of hours of practice, I can juggle pretty well and my squash reactions are not bad, but as soon as I take my mind off the toggle, it all goes to pot, the spaghetti ends up on the shirt, the glass ends up on the floor, and of/off, where/were, which/that become a tangled mess that I simply don't observe. 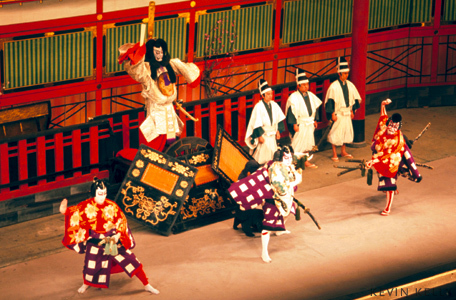 Anyway, all of this and more may go some way to explaining why the five hours of Kabuki theatre today were such a joy to watch. Every movement was precise, every glance exact, every note in its correct position, every pleat symmetrical and every colour carefully balanced to make an absolutely incredible show. I was expecting it to be a hard going few hours but several additions made it very easy (except on my legs which were squished between rows that were not designed for the likes of me). The main factor that added to the enjoyment of this incredible spectacle was that a receiver is provided with one earphone which gives a running commentary of the story, significance, history and importance of each character of the two plays and two dances that I watched today. This gives just the right amount of detail to keep you (or at least me) interested for the whole time.
) 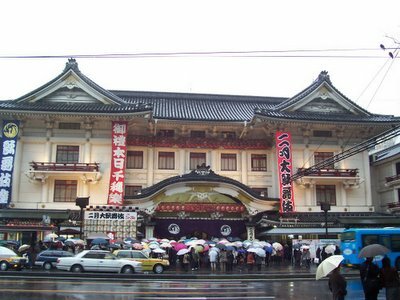 are national heroes and come from long lines of Kabuki professionals, often training from the age of two or three. The audience was almost entirely Japanese with many of the women wearing stunning kimonos. The artform is around 400 years old and although each of the plays I saw was one of the traditional ones, more are being written even now. The stage of the theatre is very wide (I guess about 60 meters) but relatively shallow. For the dances, there are a line of musicians and singers at the back, all kneeling on tatami mats in traditional costumes though for some of the plays, there's a singing narration and accompanying music from a raised balcony to one side of the stage. Props are taken on and off the stage by stagehands dressed all in black who are considered invisible and do the job so carefully that they really do blend into the rest of the performance. Unfortunately, photos cannot be taken within the theatre but here are a few I've chosen from elsewhere to give a decent impression of the kabuki experience. Anyway, I would suggest this to anyone who comes to Japan but, without a doubt, you must get the headset and, if your legs are detachable, I would suggest utilising such an ability. I'm still to sort out my photos from yesterday as I was using the camera of one of the postdocs. It appears that my camera currently eats batteries like I eat, well, whatever's put in front of me. 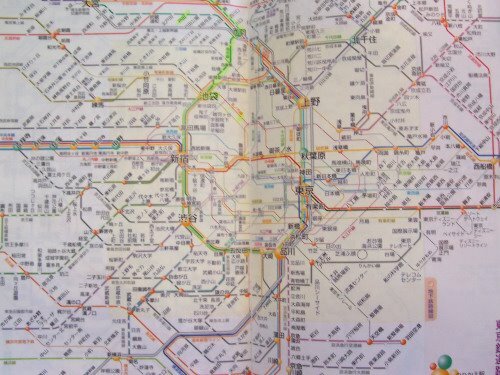 I will however upload this slightly blurred one which I hope illustrates why the Tokyo subway line is somewhat daunting at first glance.